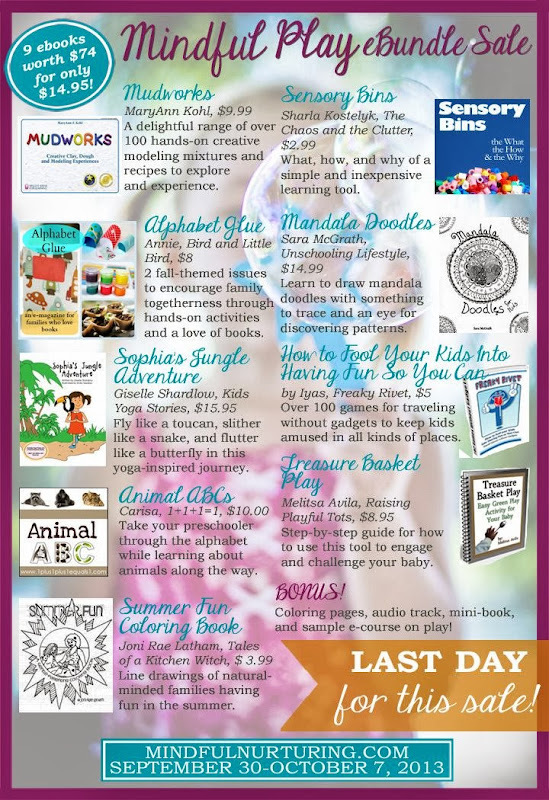 Momma Jorje: Mindful Play eBundle - Today Only! There is an amazing new e-bundle up at my affiliate partner Mindful Nurturing — in my opinion the best one so far. This bundle is entirely play-oriented and contains 9 quality e-resources for kids ages 1 to 12, plus 3 phenomenal bonuses. There's a little something for everyone: coloring pages, a yoga story book, mandala drawing initiation, treasure baskets and sensory bins, modeling play, and much more. I am personally looking forward to learning more about sensory bins for Spencer and know that Sasha will love the ABC stuff because she is really focused on learning all about letters and their sounds right now. Also, quite honestly, I am looking forward to learning how to do Mandala Doodles myself. Read more about the resources here, and then get your bundle today for only $14.95, at over 80% off a retail value of $74. Today is the last day of the extended sale, so hurry!